Found this GREAT maxi dress from Hive and Honey this morning. Loving the light chevron print. Nowadays, Chevron is so CHUNKY and BOLD (which I love – don’t get me wrong). It’s nice to see a more muted version. The model is wearing a short necklace in the image above, but I would opt for a longer one. Maybe even two or three together. 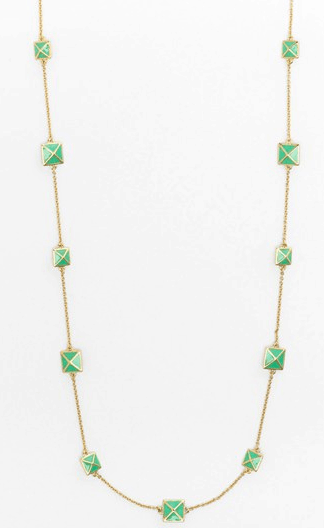 🙂 I really like the pop of green from the Kate Spade Pyramid necklace.